MaestroSafeTM product represent a new and safe class of nucleic acid stains for visualization of double-stranded DNA, single-stranded DNA, and RNA in agarose gels. The dyes are developed to replace toxic Ethidium Bromide (EtBr, a potent mutagen) , commonly used in gel electrophoresis for visualization of nucleic acids in agarose gels. MaestroSafeTM products are non-carcinogenic by the Ames-test. The results are negative in both the mouse marrow chromophilous erythrocyte micronucleus and mouse spermary spermatocyte chromosomal aberration tests. With MaestroSafe dyes, you do not need to add any dyes to both gel matrix and running buffers. 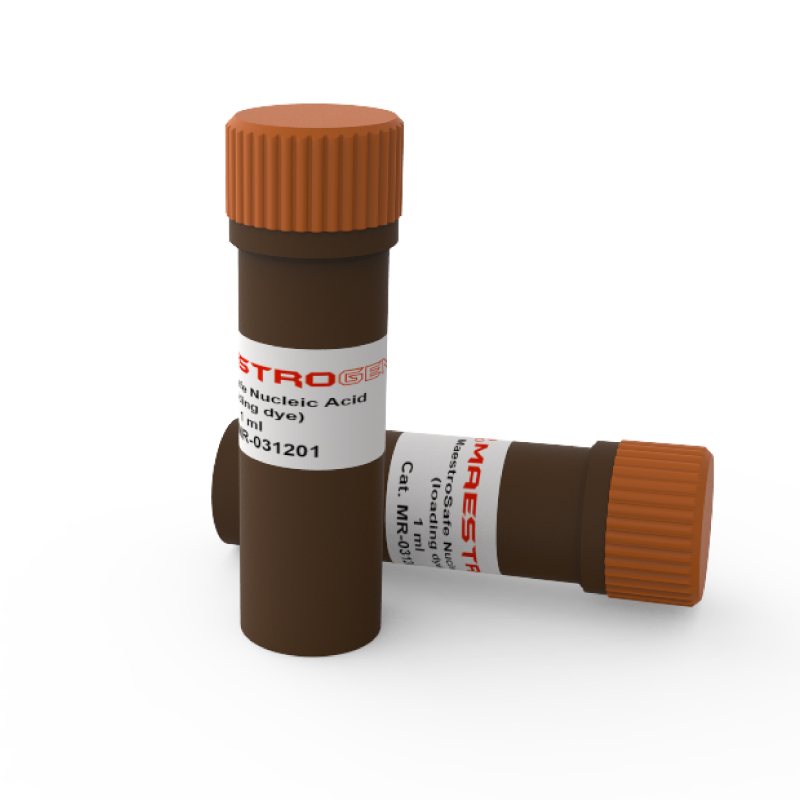 MaestroSafeTM dyes are provided in a form of 6X sample loading dyes and they are to be added to your samples only. The MaestroSafeTM dyes completely eliminate any possible contamination of glassware or gel running tank as associated with EtBr. 6.Or use non -hazardous UltraBright or UltraSlim LED transilluminator for not only good performance but also your health concerns . MaestroSafe stain can be safely released into the environment. (3)Please also refer to FL_MaestroSafe for the electrophoresis image/data of MaestroSafe loading stain. -Shipping temperature :The delivery in room temperature will be alright. (25~30℃). -Storage conditions : Our kind suggestion would be stored under 4℃ for long-term storage. -Shelf-life : Store at 4°C up to 24 months. At the same time, we’re glad to share the great news with you. Edinburgh University in UK recommends our MaestroSafe in the website. This is for your reference.